Improving your smile is easier than you think. Working in the medical field doesn’t necessarily preclude someone from ignoring their health. Take Port Charlotte resident Pam Roballo, for instance. 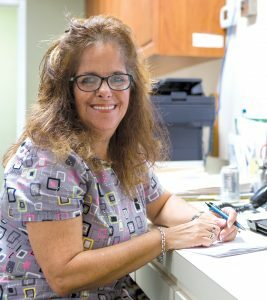 Pam, 56, has been working as a medical assistant for years, yet she all but ignored her oral health. Her disdain for dentists was the reason. “I haven’t always disliked dentists, but about sixteen years ago, I had a very bad experience with one, and that changed everything,” Pam explains. “I developed a very bad infection that spread across a lot of the teeth in my upper jaw, but instead of trying to fight it with antibiotics or something, the dentist I went to just pulled all my upper teeth out. Pam’s vow to all but renounce dentists from that point on resulted in some dire consequences. In addition to leaving her with an upper denture that never fit quite right, it provoked the steady deterioration of the teeth and gums in her lower jaw, which eventually became riddled with infection and periodontal disease. Knowing that poor oral health can cause health problems elsewhere in the body, Pam fretted over the condition of her teeth and gums for years but was too frightened to do anything about it. Then one day a little more than a year ago, she noticed something was different about a patient she had helped treat once before at work. “At first, I couldn’t pinpoint what it was that was different, and so I finally asked him and he told me he had been to the dentist and had a whole new set of teeth,” Pam recalls. “Then he started telling me about how he hated going to the dentist and had always avoided it until he met this one dentist and had this amazing experience. The dentist Pam was encouraged to call and eventually made the appointment to see is Joseph H. Farag, DMD, of Port Charlotte Dental Care. Dr. Farag practices a full scope of general, cosmetic and implant dentistry. Upon first examining Pam, he immediately saw the results of her decision to swear off dentists. 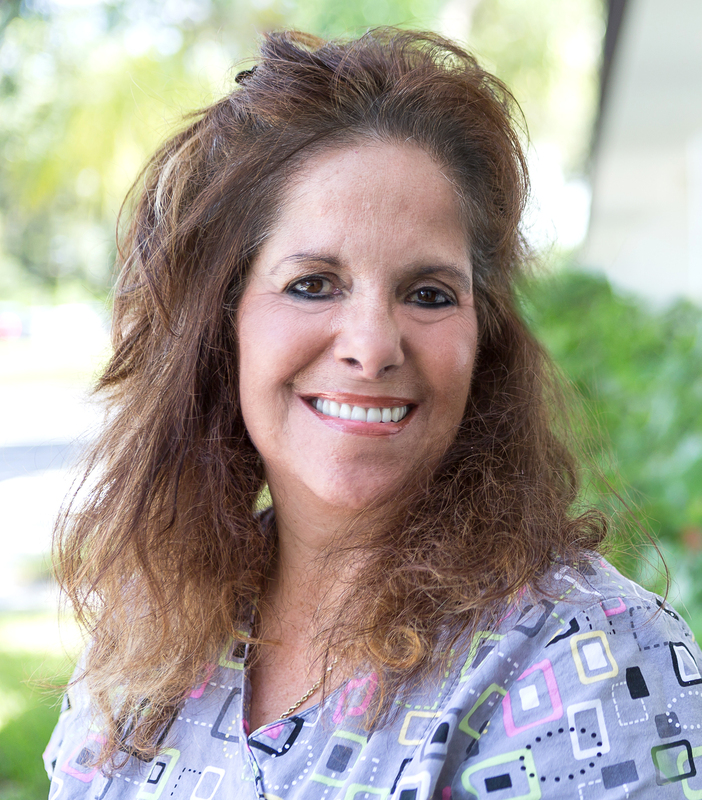 Pam had only ten lower teeth when she first visited Dr. Farag. To correct the problems that had developed with them, Dr. Farag recommended removing all ten teeth, reshaping the jaw bone and fitting Pam with an implant-retained full denture. He also suggested replacing the ill-fitting removable upper denture with a new one. Though she still had plenty of reservations, Pam agreed to have Dr. Farag correct the problems she was having with her lower teeth. Almost immediately, however, Pam’s anxiety began to get the best of her, and by the time she arrived at Dr. Farag’s office on the day of the scheduled procedure, she was in no shape to undergo the treatments. Pam says that she went home that day feeling “very discouraged” and that for a while, she contemplated passing on the game plan Dr. Farag had adopted for her. By the end of the next day, however, she had decided to go through with the suggested treatments and called to reschedule her appointment. “I eventually said to myself, Pam, don’t go down this road again and wait another fifteen years to get these problems taken care of,” she explains. 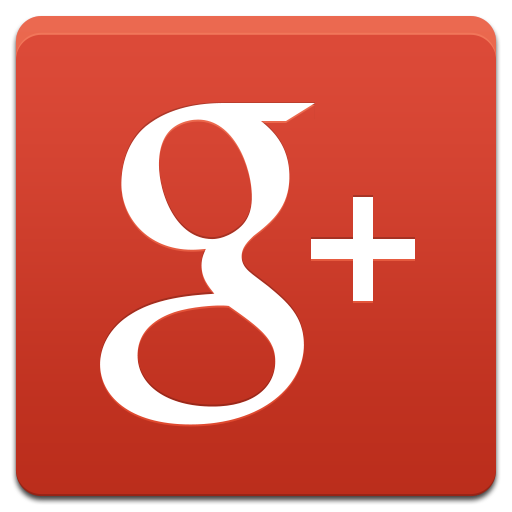 “I knew I had a very bad infection with periodontitis and all that stuff and that it needed to be addressed. But I also knew that I needed something to help calm me down. “So, I called my primary care physician and asked her to give me something that would calm me down and let me at least get in there and sit in the chair. She did that, and when I went back for the second appointment, I was fine. I can honestly say that I didn’t feel a thing they did. I don’t even remember them giving me Novocain®. Pam isn’t exaggerating about the amount of work done for her that day. During one appointment, Dr. Farag removed her ten existing lower teeth, cleaned up her diseased gums, performed an alveoplasty procedure to reshape the jaw bone where the teeth were extracted and placed two implants to serve as anchors for her full lower prosthesis. Pam says she smiles all the time now because she’s proud of her teeth. Pam accepted that recommendation as well as Dr. Farag’s suggestion that she get Life-like Dentures, considered to be the gold standard in dentures. It’s a denture design protocol that allows for a lot of patient input regarding the materials that are used and offers advantages not often associated with a typical denture. “One of those advantages is a cutter bar that goes on the molars of the denture,” Dr. Farag explains. “With typical dentures, the wearer will have difficulty chewing meats or vegetables on the back teeth because the denture teeth are plastic, they’re flat and they just kind of squish, they don’t cut. Pam, who also opted to have a new, better-fitting, removable upper denture made for her, doesn’t just like the feel of her new lower prosthesis. She likes the look, too. She says the teeth look more like real teeth than most dentures do, and she likes that the two new dentures were made to match. “My new lower denture is just great,” Pam enthuses. “It just snaps into place, and I don’t have any problems as far as chewing goes or anything like that. It’s very stable and secure, which is why I’m seriously thinking of going back and getting two implants done on the top so that I can have the same kind of confidence there. “The bottom teeth feel like they’re my own. They don’t move, they don’t budge, and I really like that secure feeling. I’m glad Dr. Farag recommended them, and I’m really glad I went to see him because I feel so much happier about my teeth. I have a smile now that I’m actually proud of. “And to think, I almost didn’t go through with this because I was so scared. I look back now, and I think to myself, What a big baby you were – and for nothing. You made yourself nuts, and you didn’t have to. I know I should have done this years ago, but I won’t hesitate again to have things done, and that’s all because of Dr. Farag. He’s really wonderful.